SAN FRANCISCO, Jan. 6 - A new state report on the Klamath River supports contentions by fishermen, environmentalists and several American Indian tribes that 33,000 fish died on the lower river last fall because the Bush administration allowed too much water to be diverted to farmers. The report by biologists at the California Department of Fish and Game is expected to figure prominently in a lawsuit against the federal government that seeks to reduce water supplies to farmers before the spring irrigation season, which begins in April. Lawyers for both sides are scheduled to appear on Thursday in federal court in Oakland, Calif. A similar legal challenge against the Department of the Interior, which regulates the river's flows, failed last year, but the extensive die-off has given opponents of the federal policy new resolve. "This time around, Exhibit A will be 33,000 dead spawners," said Glen H. Spain, the Northwest regional director of the Pacific Coast Federation of Fishermen's Associations. "The water has been overcommitted and the demand has to be brought back into balance with the supply." in California of adult chinook salmon, which accounted for about 95 percent of the dead fish. A smaller number of coho salmon and steelhead trout also died. river as "a common sense approach" to managing the fisheries' needs. The report says that of all the factors that contributed to the die-off, from the large number of fish to the presence of bacterial pathogens in the water, "flow is the only factor that can be controlled to any degree." "Man can only do so much at this particular time," Mr. Manji said. "I think every scientist would agree that increased flows would reduce the potential for a big kill." Last March, in a reversal of a curtailment the year before, Interior Secretary Gale A. Norton presided over a ceremony at Klamath Falls, Ore., in which water was released to farmers that had been held back because of concern about endangered fish. The policy switch was denounced by fishermen, Indian tribes and many environmentalists, who vowed to fight it and a new 10-year management plan for the river that would keep water flowing to the farmers. Kristen Boyles, a lawyer with Earthjustice, an environmental legal group that represents the opponents of the administration's policy, said the state report contributes to a growing consensus among scientists that diversions from the river for agriculture are harmful. The 230-mile Klamath River, which flows from Oregon to the Pacific Ocean near Redwood National Park in California, supplies irrigation water to about 200,000 acres of farmland through the federal Klamath Reclamation Project. Last October, a biologist with the National Marine Fisheries Service sought federal whistle-blower protection after claiming his agency was pressured by the Bush administration to accept water flows in the 10-year plan that were too low to support fish. The biologist, Michael Kelly, said the low flows threatened coho salmon, which are protected by the Endangered Species Act. Jeffrey S. McCracken, a spokesman for the Bureau of Reclamation, the Interior Department agency that administers federal water policies, defended the decision last year to divert more water to farmers, saying it was based on advice from federal biologists. He said a decision about this year's flows would not be made until studies of the fish die-off are completed by the United States Fish and Wildlife Service and the National Academy of Sciences. Mr. McCracken questioned the objectivity of the new report by the California biologists, since state officials began blaming the federal government for the fish kill last September, when the fish were still dying. "The conclusions really aren't a surprise to us, given they arrived at these same conclusions even before they did the study," he said. "It is nothing that they haven't already said." 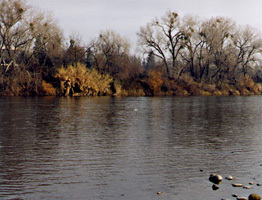 Jonathan Birdsong, a spokesman for Representative Mike Thompson of California, who in October introduced legislation to block the Bush administration plan for the river, denounced the bureau's attitude toward the state report. "This administration has always said the best science is in the states, that the states are closer to the people," Mr. Birdsong said. "The fact that they are discounting the state experts is a little disheartening. It is more than that. It is hypocritical." But Dave Solem, manager of the Klamath Irrigation District, whose members farm about 40,000 acres of land irrigated with Klamath water, said he also viewed the state report with deep suspicion. "All of these things are focused on one thing: to be used as evidence in court," Mr. Solem said. "I can guarantee this will be regurgitated many times over and over. It becomes scientific fact just because they put it out."